The CD-2 Knit Braider is one of the fastest and most efficient circular warp knitting machines used in production today. 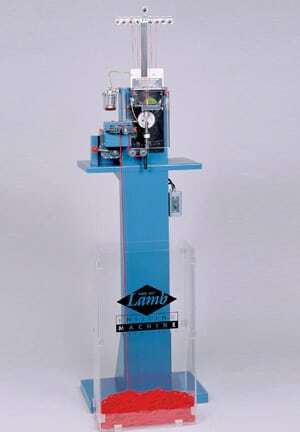 The CD-2, as with all LAMB Knit Braiders, incorporates the use of stationary packages which eliminates the need for costly yarn respooling (bobbin winding). It is specifically designed for the high speed production of materials 3/8″ diameter or less. The CD-2 is used for knit braiding shoelaces, soft and hard drawstrings, elastic or rigid cords (with or without core) and trims. The CD-4 Knit Braider, a modified version of the CD-2, offers the newest in circular warp knitting – pattern capability. The CD-4 is used to produce cords with either a spiral, zig-zag or chain stitch, something no other production knit braider can offer today. Be the first to review “Model CD-2/CD-4 Knit Braider” Click here to cancel reply. Latch needles on single cylinder and single feed system with two stitch repeat [CD-2] /four stitch repeat [CD-4] sequence. Working diameters from .18″ to .38″ [5 to 9.5 mm]. Needle gauges from 5 to 15 needles per inch. CD-2 – 1700 cpm / CD-4 – 1300 cpm. Solid or multi-color tubular knits for use as shoestrings and laces, decorative cords, drawstrings, all with or without cores, elastic or rigid cords, and trim materials. Also used for making tubular flat and flat materials used as athletic shoelaces and trims. Roll-up attachments, stop-motions, elastic power feed, and counters.